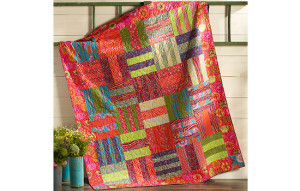 Discover the wonderful world of quilting! Students learn the basic skills of quilt making such as rotary cutting, piecing, borders, quilting, binding, and labeling as they construct a charming Rail Fence wall hanging using “Start Quilting With Alex Anderson.” Bernina sewing machines available for class. Basic quilting tools (rotary cutter, ruler and mat) and book necessary to purchase for class.